I was craving veggie burgers tonight but didn't have the greatest selection of stuff in my pantry. It's amazing and amusing what can happen when faced with bits of this and that. I combined ideas from previous burger-making recipes to go with what I had to work with: firm tofu, some oatmeal, a few nuts, shredded carrots and onions and stuff, and then smushed it all together in the food processor. Sorta turned to mush, but the texture held together nicely. This attempt isn't my finest burger, they're awfully flat and thin, but my kids liked them and they did turn out quite tasty, I think you'll enjoy them. Mix in the bowl of the food processor by pulsing on and off, until well mixed, but try not to turn into complete paste. You may want to taste and make sure they are salty enough, add some if needed, they will be more bland after cooking. Form about 6 large patties or if too moist, just spoon into a circle in a hot, well oiled skillet, and cook slowly over medium heat. Cook the first side with the lid on, then remove lid for the second side. My kids ate these before I got a chance to take a picture of one on a bun all purdy with all the "fixins"... so just imagine that part. They'd be good baked with a mushroom gravy I bet, too! I think they look and sound great. Bumping up here to let you know I made the chikn and dumplings and it was a hit in my house. Very tasty! oatmeal-tofu veggie burgers... BRILLIANT!! looks delicious. Those burgers look delish to me! yum!!! !, i love how tasty they look! 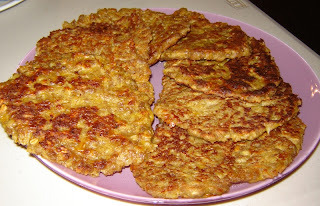 You know a few weeks ago I had an oatmeal pattie and I was truly surprised at it's taste. It was really very good.